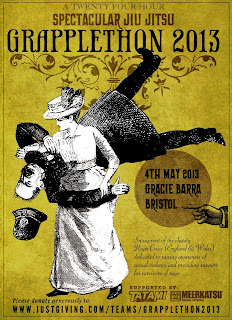 slideyfoot.com | bjj resources: 27/02/2013 - GrappleThon 2013 Passes £1000: Please Keep Donating! 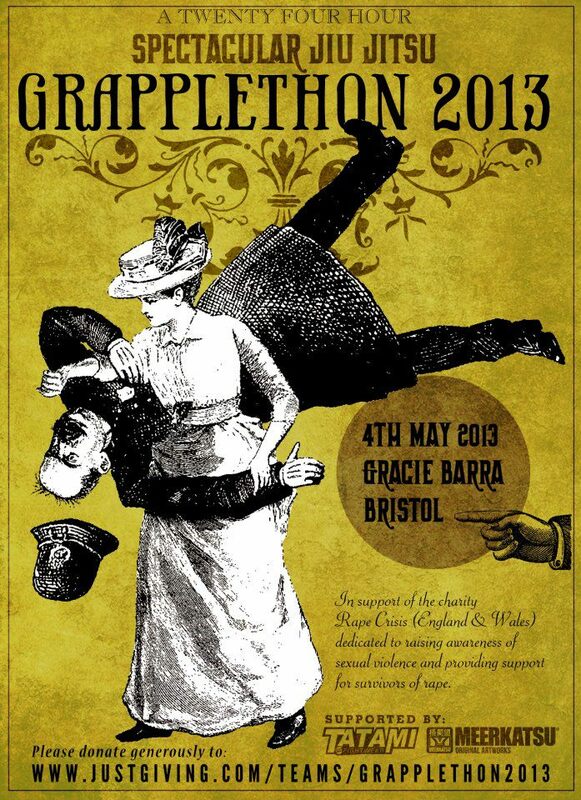 27/02/2013 - GrappleThon 2013 Passes £1000: Please Keep Donating! In regards to class tonight, things started off with the usual self defence portion of Gracie Barra Fundamentals classes. This was intended as a response from closed guard to when somebody tries to punch you. Hold both their wrists, then when they put up a knee and wind up for the punch, hook their leg, swivel and armbar them. That's an interesting contrast to the Gracie Combatives approach to blocking punches, which mainly relies on keeping them close if they try to punch, then create distance to get out of the way if possible. The main techniques tonight were both chokes from the back, using the gi. Both of them start with the typical seat belt grip, one arm under their armpit,the other over their shoulder. With your armpit hand, open up their collar, folding it over to create two layers of cloth. Feed this to your other hand and get a firm grip. Try and bring the shoulder of your choking arm towards your choking hand, with the choking elbow moving behind their head. With your other hand, grab lower on their other collar. Drop to your choking arm side, then pulling down on their other collar, tighten your grip with your choking hand. Move your upper body backwards to add further leverage and complete the choke. The second choke was much the same, except instead of grabbing their other collar, you thread that arm behind their head, trapping their arm in the process. You then also have the additional leverage of that arm behind the head to help your choke. Class finished off with some specific sparring from turtle, where you already have a strong grip, securing their opposite collar and pulling it tight across their hips. This also served to remind me how totally rubbish I am at attacking the turtle. For some reason, I rarely find myself in this position: not quite sure why, unless I'm subconsciously avoiding it. Anyway, I was crap on top of turtle: that wasn't helped my only being able to use one leg properly, but even if I'd been in full working order, I still wasn't able to mount much of an offence. Underneath didn't go a whole lot better: I think I managed to escape once, but that was because a white belt reached too far inside with their arm, and even then it took me a bit of scrambling to get to a controlling position on top. Geeza quickly showed me what I should have done later, which was basically using that strong grip to pull them in towards me as I move to the side, establishing back control. Definitely a position I need to work more, once the leg finally heals up. For the moment, I'll continue concentrating on passes and the top position, as that doesn't aggravate the injury, but as soon as it is working, I'm really keen to improve my guard and back control. Back escapes are a high priority too, which I should be able to do with the injury.